For those new to this story, Believers’ Church is the church started by Gospel for Asia founder K.P. Yohannan. Yohannan is CEO and International Director at Gospel for Asia and he is the supreme Metropolitan Bishop in India for the Believers’ Church. Although undisclosed in their 2013 audit, GFA sent just over $20 million to Believers’ Church in 2013. Believers’ Church in India received far more than Gospel for Asia India which was not disclosed in the audited financial statements. Within the last year, questions arose among staff about the accuracy of the “anonymous donor” story and Carroll and Yohannan addressed those questions during the May 14 staff meeting. In that meeting, Yohannan asserted that he had nothing to do with the Believers’ Church’s decision to send nearly $20 million back to Texas. A major part of his defense was his claim that he does not sit on boards or trusts in India and has no legal authority in Believers’ Church. Yohannan claims he didn’t have authority to direct the donation and didn’t have anything to do with it. Here is what Yohannan said about his membership on boards and trusts in India and his legal authority. In previous posts, I have shown government and church documents which contradict his claim. 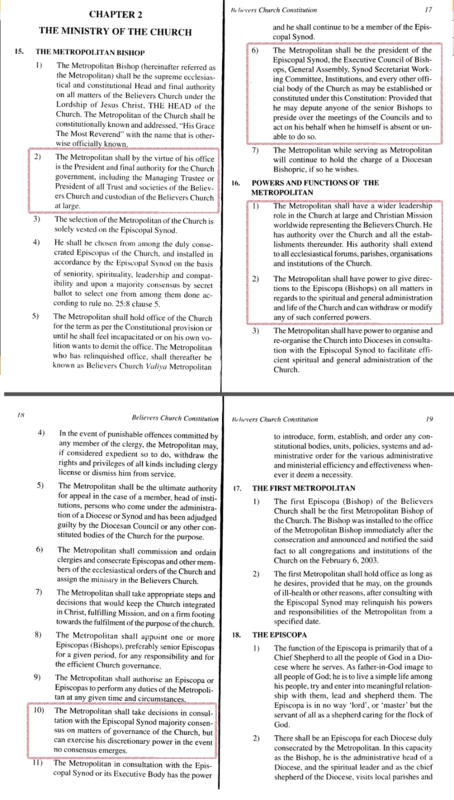 Today, I provide portions of the Believers’ Church Constitution which describe the massive authority and power of the Metropolitan Bishop, His Grace the Most Reverend K.P. Yohannan. It is clear that Yohannan misled his staff. 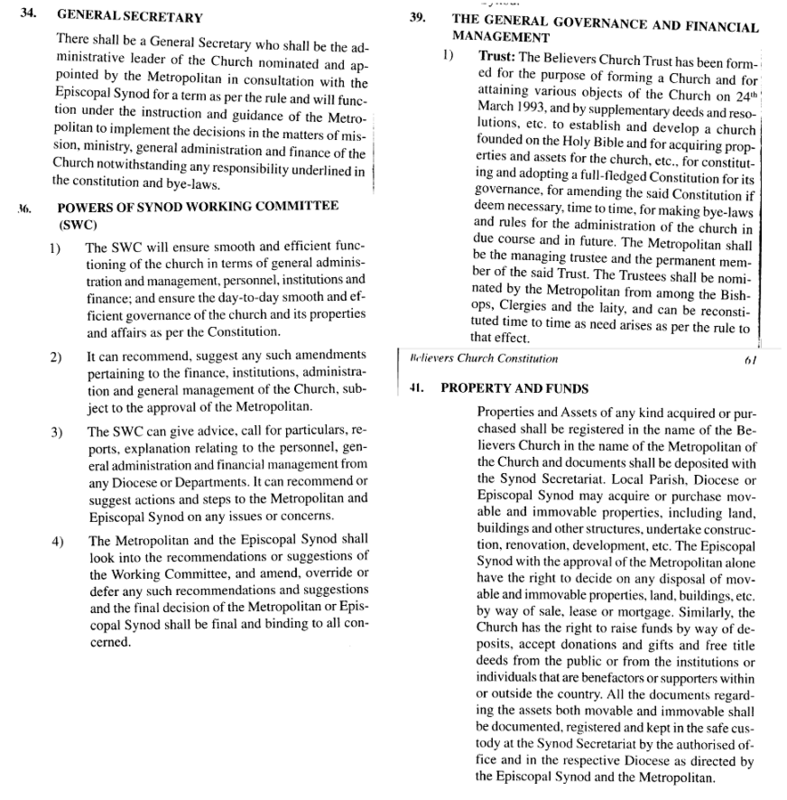 If Believers’ Church follows the church Constitution, there is no way Yohannan did not approve the gift to help complete headquarters construction. Yohannan is President of all church trusts, he has discretionary power over governance of the church, he is the final authority of spiritual and administrative matters and he is the managing trustee of the church. It is inconceivable that Believers’ Church could spend $19.8 million dollars without his approval. Sections from chapter three make this even clearer. Buying and selling movable and immovable property and any management matter can be overruled by Yohannan. Committees can suggest actions but they must be cleared with Yohannan first. If you read the ECFA report, you discover what we (board members–USA) had begun to know–we were kept in the dark and limited to pedantic decisions. As I saw this, I began intense confrontations with KP which I thought were gaining traction. The surprise revelation of foreign deposits and monies returned from the field (and previously described as from an “anonymous donor) pushed some of us over the edge and made our board membership untenable. David Carroll and K.P. Yohannan told staff that the transfer of funds was completely legal and there was no conflict of interest since Yohannan had no control over the decision. He also said the $19.8 million was not a related party transaction. DC [David Carroll] – It’s completely legal, thank you. There’s a board member, board documents as I understand it, I don’t live in Asia, but there’s board documents on the other side. The whole thing was done in complete legality. KP [K.P. Yohannan]– I think David, it is important for people to know the person I am. It’s like Paul said in one place he’s a doulos, he’s a servant, another place he’s an apostle, another place he’s a brother, and my role is being a spiritual father of right now about 2.7 million people scattered throughout all these nations and I do not have any legal say or decision about legal matters. My role is a spiritual leadership. You may not have asked that but there are hundreds of trusts and entities in all these countries. I don’t sit on any of those things. There are their own people. And my role is the spiritual leadership. And I hope to some extent that is here also. It is not a related party transaction because the board members here, they’re not the same board members as there. And so, what the people in Asia did, and it is a board that is under Believers’ Church umbrella, but Brother KP’s not on that board, it wasn’t his decision. K.P. Yohannan is CEO and leads the Gospel for Asia board here and he is by Constitution the managing trustee and President of Believers’ Church and all other Believers’ Church trusts. I can’t see how these claims by Yohannan and Carroll and the Believers’ Church Constitution can be true at the same time. * David Carroll said there are “board documents on the other side.” Well, the board documents that I have seen don’t support what they told staff in May. Might be time for GFA leaders to produce those documents. It is already too late for three board members who quit over this matter. *I suppose it is possible that Believers’ Church approved a new Constitution prior to the 2013 gift. However, my source denies that and tells me that this Constitution was binding at that time. I am certainly open to hearing from GFA and BC with new information. Next Next post: Board Members Quit Floundering Teen Mania; Will Gateway Church Continue Support?